A special blend of high strength herbs and antioxidants with enhanced hydration while you sleep, offering nutritional support for healthy skin. H3O Night Repair is rich in Calcium, Magnesium and Vitamins A, B, C, D & E. Includes pine bark, grape seed extract, astragalus and astaxanthin. Not to be taken if you are pregnant or breastfeeding. If taking any medication or if you have any health concerns, please consult a doctor before use. 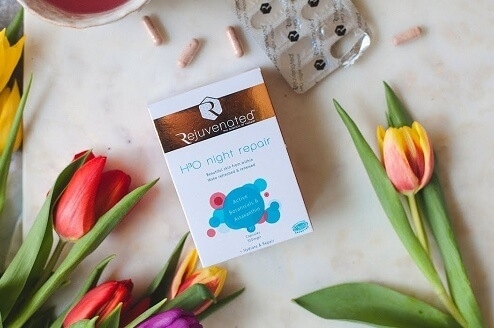 "Rejuvenated's overnight supplement has everything you need to bolster your skin's repair while you sleep. Hyaluronic hydrates and plumps the skin cells, and a cocktail of minerals keeps cell metabolism firing." Byrdie "I noticed that my skin was much more even in tone" Stylist "Hydration and free-radical fighting as you snooze. If beauty sleep came in a packet it would look a lot like this." Reapir Extract complex (grapeseed Extract , Ionic electrolytes, Maritime Pine Bark Extract, Astragalus Root Powder Extract, Astaxathin, Hyaluronic Acid), Vitamin Complex (Ascorbic Acid (Vitamin C), D-Alpha-Tocopherol (Vitamin E), Niacin (VItamin B£), Beta Carotene (Vitamin A) Riboflavin (Vitamin B", Vitamin D (cholecalciferol), Capsule Shell (vegetable Cellulose).